VodaHost Review 2019: Is VodaHost a Good Hosting? Founded in 2001, VodaHost is one of the low-cost web hosting services in the U.S. They’re a one-stop-shop for shared hosting, SSL certificates and domain registration services in addition to reseller hosting packages. VodaHost offers a range of Linux-based hosting plans with a good number of features at a reasonable price besides SSL certificates and domain registration services. Though based in Delaware, they have offices in Singapore, Australia, and the U.K. Their infrastructure is hosted at the Planet Data Center. VodaHost makes it easy for beginners and professionals to create their websites. With a few clicks, you can create a database-driven website using their one-click software installer which comes with a number of Open Source web apps such as Joomla, WordPress, phpBB forum, Guestbook, and many more. If you’d like to set up an ecommerce website, you can do so easily using any of their ecommerce CMS frameworks such as ZenCart, OsCommerce, Cube Cart or any of the supported third party carts. Using Soholaunch, you can create a mobile-friendly ecommerce store with shopping cart features via a user-friendly interface. It’s a great alternative to the osCommerce shopping cart. You don’t need any technical expertise. Just choose the template and plugins you want and customize them accordingly. You can also embed social networking buttons, Google Maps,custom forms, and a QR Code Generator. Looking at their hosting packages, it’s clear that VodaHost gives their customers real value for money. They have feature-rich packages and lots of free complementary tools that most shared hosting providers don’t offer customers. 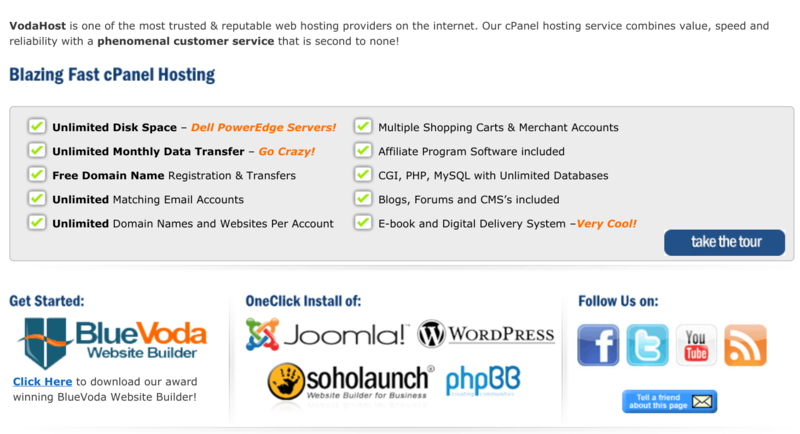 You can order a hosting package and pay conveniently via PayPal or any of the major credit cards. Though VodaHost doesn’t charge customers set up fees or tie them down with contracts, they have stringent no-refund policy. So keep that in your mind in case opt for their monthly, annual or biennial hosting plans. Customer support is available 24/7 via email, online ticketing, and telephone. When submitting a ticket, send it to the appropriate department so you can be assisted quickly. From the customer portal, you access their online knowledgebase, check announcements, and even place a new order. Their online knowledgebase is a wonderful hosting resource which covers the A-Z of using their website builder, cPanel, shopping cart, DNS management, FTP, and email accounts. You can also dig in at their Support Forum if you need advice or suggestions from the 125,000+ active members. If you’re looking for hassle-free and affordable shared hosting with cPanel for your WordPress sites, VodaHost is a great choice. They offer feature-rich packages and lots of free tools that can help you get your business online in no time. Check out VodaHost’s web hosting options today! Wondering how VodaHost stacks up against other Web Hosting companies? Enter any other Web Hosting company and we will give you a side-by-side comparison.